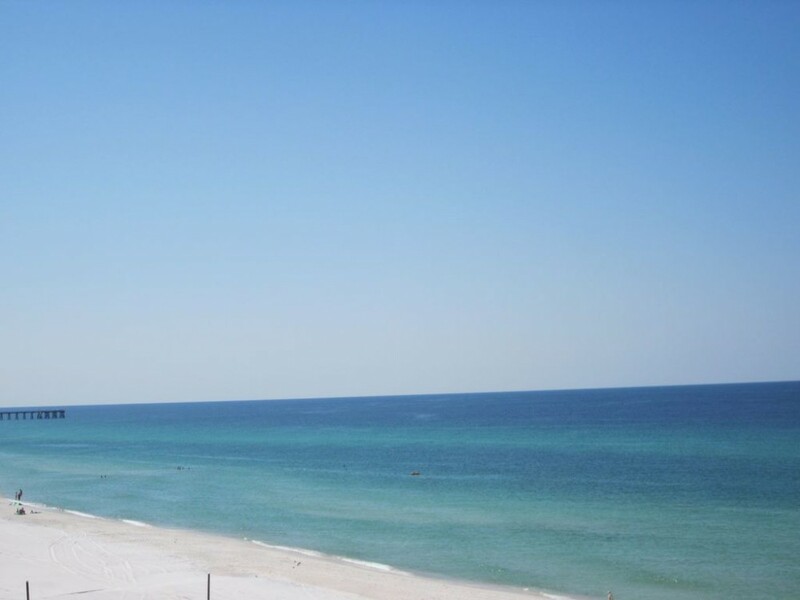 This is a beach-front condo located on western area of Panama City Beach and is a family friendly area. Are you dreaming of crystal clear water, a sugar sand beach, and magnificent sunsets? Enjoy them all from the balcony, dining room, kitchen, and living room of this picture perfect, fifth floor condo. The master bedroom has a king-sized bed, walk in closet, dressing area with lavatory, and bathroom. The second bedroom has a queen sized bed. The furnishings are tasteful and the kitchen is fully equipped. Walk across the street to the supermarket & drugstore or eat in one of several outstanding restaurants. A fresh seafood market is within two blocks. Enjoy Pier Park with a movie complex and great shopping (for more details goggle Pier Park at Panama City Beach, FL.) There is a great variety of activities within the sound of the surf. Use your wireless computer to surf the net in the condo or by the pool. Note: During the months of June and July, there is a 5 night minimum. Weeks start & end on Saturdays and partial weeks must either start or end on a Saturday. Bookings less than 5 nights will be accepted only within a week of the rental if the unit is still available. The taxes are levied (by law) on the rental plus the cleaning fee (City of Panama City Beach=1%). County and state taxes are levied (county-5%, state=6.5%) on the rental plus cleaning fee + Panama City Beach tax. Comes to 12.615% levied on rental + cleaning fee. Security/damage deposit of $250 is due at booking. One half the rent +taxes & cleaning fee is due 30 days in advance; balance due 15 days in advance. We accept personal or business checks, bank drafts, cashier's checks, or money orders. We are unable to accept credit card payment.